Bruno is sad remembering the good times. He used to have friends, but now he is alone. Bruno is 3 years old, almost 6ft. tall, and weighs about 1,000 lbs. His antlers span almost 6 ft. 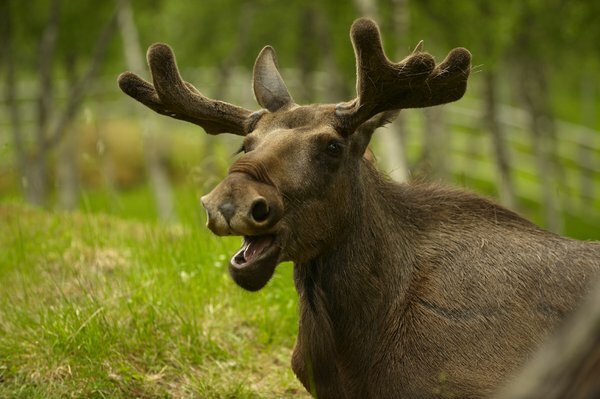 He is an Alaskan Moose. His name means "brown shining armor." When he was born he was very happy living with his mom. His mom was kind and loving. His mom was so kind, she had many friends. 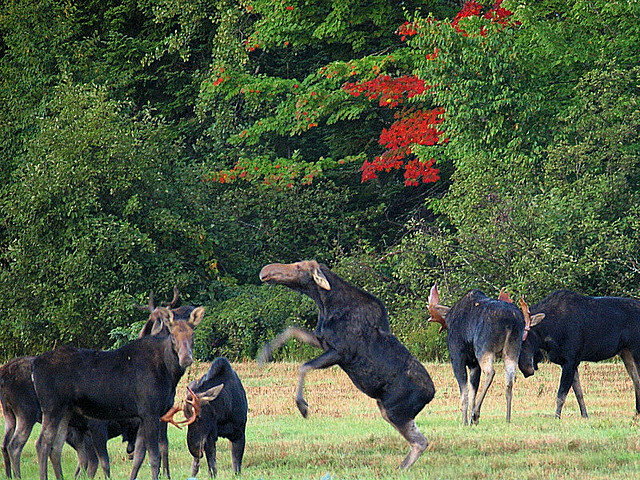 Moose don’t hang around with each other normally. Normally, a cow mom and her baby live and hang out together. His mom was the exception. She had friends who loved to hang out with her. They didn’t do it all together, but one cow at a time and her baby were always near. The cows would take turns coming by to spend time with Bruno’s mom. This way, Bruno always had another baby moose to play with. His friends included: Petey meaning "stone" and pronounced PEE-tee, Kieron or "little dark one" pronounced KEER-an, Emmi pronounced EM-ee meaning "rival," and Hilda pronounced HIl-duh meaning "battle, war." Bruno always got along with the young cows and bulls. They played tag, ran around, and splashed in the river and beaver ponds. Petey and Bruno were like best friends and tried to spend more time together. Bruno started growing faster than the others. Soon, he was noticeably taller and putting on muscle. He didn’t look like a baby anymore. Hilda didn’t like Bruno, but thought the world of Kieron. Every time she was around Bruno she talked about how fast and strong Kieron was. Emmi was her cow friend and Petey was just another moose to her, but she thought Kieron was special. Hilda didn’t like it that Bruno was getting larger and stronger than Kieron. She wanted to do something that would make Kieron look better and Bruno look bad to the other moose. “Come over to the pond and I will show you.” said Kieron as he turned and walked toward the pond. Bruno followed. Looking down in the water he saw his reflection. Sure enough, there was a small nub growing out of his head on one side and another smaller one on the other. Bruno thought this was cool until he saw the expression on Kieron’s face. “I’m sure yours will start soon and will be larger.” reassured Bruno. Kieron trotted over to his mom and nudged her that they should go. Soon she obliged, and off they went home. Bruno was so excited to tell his mom he didn’t notice the look he got from Kieron as he was leaving. 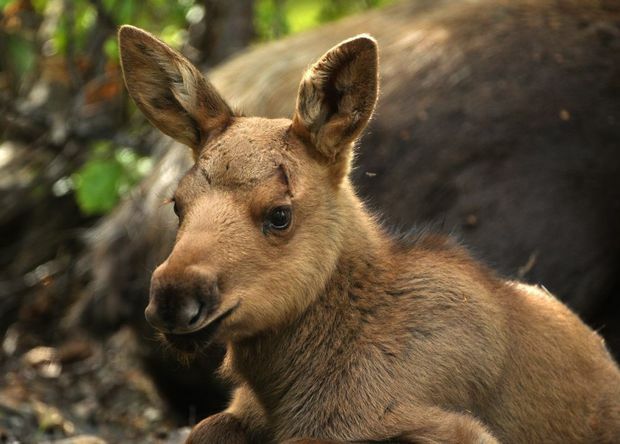 Bruno smiled as good as a moose can smile and laid his head against his mom’s side. He was excited to be growing up but wasn’t sure he wanted to be out on his own. The next time he saw Hilda, she seemed strangely distant. She didn’t want to play or go exploring like she used to. It was the same with Emmi who came the next day. When Petey came, he was the same as always and glad for Bruno, asking all sorts of questions like: Did you feel them come up? Do they itch? Do you know when they will stop growing for the season? Do you know how large they will be? One day all the moms got together because it was Bruno’s mom’s birthday. They brought their young to play together. They had never been all together before and Bruno was thrilled. He bounded up to them like an excited puppy. He stopped short of colliding with Petey. Hilda looked at Bruno then the others. She nudged Emmi and said, “See I told you.” Emmi looked at Bruno standing between Kieron and Petey. “Right about what?” inquired Bruno. “Nothing.” said Hilda quickly before Emmi could respond. Emmi said, “Why don’t you bulls have a race in the meadow?” The bulls looked at each other. The race began. It was a blur of dark bodies running around the tree and back. Then Bruno took the lead. His longer legs had the advantage. He won! Bruno had never done anything like that before and it felt great! Petey was happy for his friend and in the excitement of the moment so was Kieron. The boys walked over to the stream for a drink. Hilda and Emmi were disappointed. When they had come up with this plan they thought Bruno would trip over his long legs and come crashing down. They wanted him to fail. Kieron eyed Bruno then said, “I hadn’t noticed before, but your tail looks like a wolf’s tail. You are looking might funny Bruno.” The three started laughing. Petey just stood there. Bruno blinked at them and lowered his head then walked away. He could still hear them laughing when he went to stand by his mom. The next day, Emmi’s mom kept calling Emmi to hurry up. She said, “I don’t know what has gotten into that cow. I think she has lead in her hooves.” Emmi stayed back and would not come close to Bruno. She pretended she was grazing on a wonderful plant and couldn’t come over. Bruno knew she didn’t want to be around a freak. He walked off in the other direction. He was tired because all night he kept playing the scene from yesterday in his head over and over. He could still hear their laughter. He went to the beaver pond. 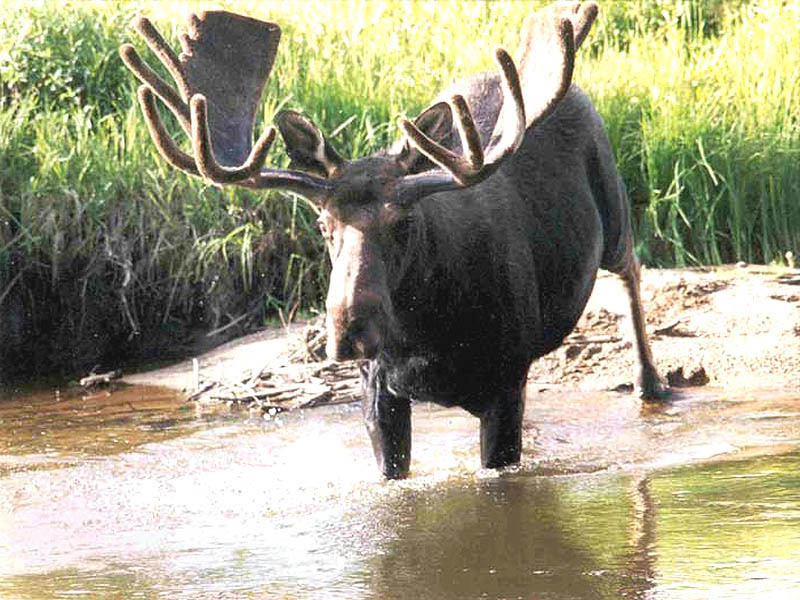 He was lying in the grass near the water when he heard- “There is the strange looking moose I was telling you about. 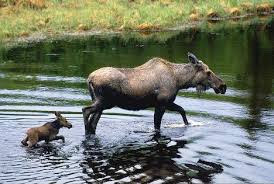 Don’t get near him; you may catch what he has.”Bruno looked over and saw Hilda talking to another moose he didn’t know. Laughing they went away. This kind of stuff went on every time he was around young moose. Every day, Bruno was growing taller and stronger. His antlers were coming in nicely. But he was becoming more and more sad. He didn’t have any friends. Those few months were good and bad for Bruno. Good, because he was with his loving mom and he felt cared for. Bad, because he was teased by everyone and felt rejected by them all except for his mom. Too soon it was time for him to go off on his own and make a new life. His mom encouraged him by saying he was ready and could take good care of himself. Now, he was alone. No friends or family. What do you think about this story of Bruno? Have you seen someone teased and made fun of? How do you think that person feels? I’m sure they feel sad and lonely. I am disappointed in Hilda, Emmi, and Kieron. They treated Bruno badly. They were wrong in what they did. I’m also disappointed in Petey who didn’t stand up for his friend. He just stood by and watched. That is almost as bad. Kieron, Emmi, and Hilda were mean in what they said and did. Petey was mean in not doing anything. What would you have done? How do you treat others? Are you the one who has been treated badly? Have you been hurt by others? Do you understand what Bruno went through? People can be mean, especially children. Sometimes they act like your friend then they turn against you. I remember those times. We need to be kind even when someone is mean to us. Remember, we need to forgive those who hurt us. We need to remember our parents and family love us. We are loved by the Lord. He loves us more than any person can. The Bible says: Deuteronomy 31:6 Be strong and of good courage, do not fear nor be afraid of them; for the Lord your God, He is the One who goes with you. He will not leave you nor forsake you. 1 Peter 5:7 casting all your care upon Him, for He cares for you. Isaiah 41:10 Fear not, for I am with you; be not dismayed, for I am your God. I will strengthen you, Yes, I will help you, I will uphold you with My righteous right hand. God also talks to us about being kind to others. Kindness is one of the fruits of the Spirit. You can find that list in Galatians 5:22-23. Ephesians 4:32 And be kind to one another, tenderhearted, forgiving one another, even as God in Christ forgave you. Memorize: Isaiah 41:10 Fear not, for I am with you; be not dismayed, for I am your God. I will strengthen you, Yes, I will help you, I will uphold you with My righteous right hand. Or : Deuteronomy 31:6 Be strong and of good courage, do not fear nor be afraid of them; for the Lord your God, He is the One who goes with you. He will not leave you nor forsake you.